David (D M) Cornish is already known as the author of the ‘Monster Blood Tattoo’ series and I Don’t Want To Eat My Dinner is his first picture book. Also illustrated by the author, it is the story of Rollo who finds eating a bore. He would much rather be kicking a ball, playing with his dog or trucks. The story and illustrations begin predictably, however, once Rollo starts to chew something changes in the illustrations and in Rollo. Tasting something hot, Rollo’s tongue bursts into flames and a tomato fire truck arrives to douse the raging fire. Although Rollo still proclaims he doesn’t want to eat his dinner, his imagination begins to take hold and he is transformed into a diplodocus, ready to eat a forest of trees which in reality are pieces of broccoli.As dinner and the book progess, we see Rollo’s shouting subside – the text becomes smaller as Rollo’s imagination continues to help him clean his plate until it’s time for dessert. 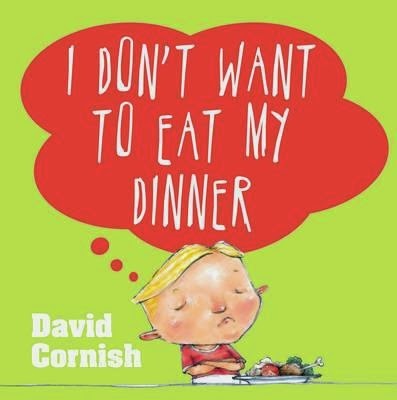 Simple text and brightly captivating illustrations will make this book a welcome addition in overcoming difficult mealtimes. It has the added advantage of inspiring the imagination of young children as they conjure alternatives for the food on their plates.